I have this theory that everything is getting cheaper. Except houses of course. Take beer for example. In 1976 a pint of beer was 30p. Sounds cheap? Well average earnings are now more than seven times what they were then. It depends where you sup your pint of course – for example the Holiday Inn or Wetherspoons. The latter will serve you a decent pint for 99p – just over three times the 1976 price. You get my drift? I was sitting on a half-empty flight from Birmingham to Shannon pondering the cost of the flight. The ticket had cost me £55 return, more than half of which was tax. This surely cannot be economic. I was reading a Racing Post article about how we should support British National Hunt racing, as it is under threat from the OFT. Here I was flying to Limerick when my home track of Ludlow was racing that day. I was feeling guilty. I looked up from the RP and the author of the article was standing in front of me. “Hello Alastair are you going to Limerick races?” It was too late I’d said it. Well-known people must get fed up with strangers addressing them by their first names. He was very sociable though, as we exchanged views about Irish racing and the journey ahead of us. He was going over to chair a Cheltenham preview night in Adare, just south of the racetrack. Unfortunately it was fully booked otherwise I would have been there. Off to the Greenhills Hotel for my two-night stay. Its leisure centre with swimming pool was the attraction. My 1997 Egon Ronay Guide informed me rooms were £110 per night. Maybe they were seven years ago but surfing the net I was able to find a room rate well under half this. From the outside the building looked a bit of a 60s monstrosity, but the leisure facilities were top notch. A quick swim and then a drive to the track at Patrickswell, a few miles south of the city. I won’t bother telling you how cheap car hire was via the internet. What did we do before we surfed? Get ripped off by one of the “majors” on arrival I guess. I’d been to the old city track at Greenpark, which closed down in 1999. The new track opened in October 2001, so it was a chance to see how things have improved. 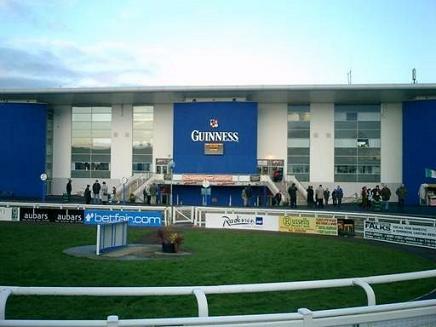 The first racecourse to be built in Ireland for 51 years, Limerick was awarded grade one status on opening, to put it on a par with the Curragh, Fairyhouse, Punchestown and Leopardstown. They race seventeen days a year. What you can’t fail to notice when you arrive is the “Guinness” stand which can accommodate 6,000. It has a 500-seater restaurant and numerous private suites. And lots of tote facilities of course. On to the punting. It was absolutely freezing, courtesy of a biting cold wind. Not good conditions for standing around in the ring. Having lost in the first two races I attempted to solve the Grand National trial. Not a great race as none of the first three home was engaged at Aintree. Won by Lanmire Glen in good style with Ruby Walsh in the saddle. I was on Polaris Dream, which never looked like troubling the judge. More carnage in the next. There was a big ring plunge on Dizzy’s Dream from 7/4 to evens. As they jumped off it was showing 2.90 on the tote, so I stepped in with a chunky bet. As they cleared the first, I glanced at the tote to see the odds shrink to evens. It wasn’t that big a bet! I no longer wanted to be on! You can guess the rest. Point here for the British tote perhaps. The Irish “will pays” now remain on screen until the winning dividends are declared, so you can confirm the expected dividends anytime during a race or as soon as the winner has past the post. Space permitting – why the hurry to take down the “will pays” anyway? Short price favourite wins the fifth so on to the sixth without a singe pick-up. At last some inspiration, as I find Come In Moscow in the six-runner handicap chase. Wins by an astonishing 11 lengths at 11/2. Pays 10/1 on the tote. Out of jail. Our Ben wins the bumper for Willie Mullins but only at an unbackable 4/5. A losing day but would have been disastrous without the sixth-race winner. I was cold and hungry so headed into town for something to eat. Decided on the Eastern Tandoori, which boasts a few guide mentions. Not a great choice as it turned out. I don’t think I’ve had a really good Indian in Ireland – not even in Dublin. Certainly not up to what you can get in London or Birmingham. The Tandoori dishes were too red and the price of the Cobra beer was a serious challenge to my deflation theory. The restaurant seats about 150 and there were only a few early evening diners. Two lads came in and asked if it’s no smoking. No was the answer so they were seated right next to my table. Fair play to the lads for asking, but I thought to myself – there will be a no-smoking area next month, it will be called “The Restaurant” because all pubs and restaurants in Ireland would be non-smoking from 29 March! The self-righteous fascism of the ex-smoker. Day two and into town to visit the Hunt Museum before racing. Ireland’s museum of the year. Quite a lot to see including a couple of Jack Yeats’ paintings. Those of you who have visited my website will know I am a big fan. National Student Day at the track with another tricky card to encounter. A couple of maiden hurdles to start off – managed to find winner of the second, Native Stag a 4/1 chance. No big deal. It proved too difficult in the next four races and I was well behind going into the Bumper – the getting out stakes. I pick two against the “talker” Eddie O’ Grady’s Sidalcea, forecast to go off at 4/6 in the 16- runner. JT McNamara does the business for me on 10/1 chance Fourstargale. Allow me this indulgence from the Racing Post analysis “made all, clear early, drew clear again from 4f out, stayed on well straight”. Won by 9 lengths and paid 22.70 on the tote. What a way to finish! As the live band start up with “Babylon”, everything seems a lot better than it did an hour ago, despite the (limited) losses. I look out into the gloom to watch the publicised Beef Or Salmon gallop, but learn later it had already taken place that morning. The trip was concluded with dinner at Rogue Traders, the restaurant section of a pub called the Bank (it’s in O’Connell Street near the Arts Centre). Some excellent fish cakes, a large glass of Sauvignon Blanc followed by a fabulous Banofi pie. Strongly recommended. Next stop Tralee in June to complete the box-ticking. No doubt the flights will be down to £40 by then.